Through the fusion of design and 3D manufacture, the 4d creations architectural feature service for interiors was launched. We offer the design and manufacture of bespoke 3D artwork pieces that allow you to explore using metals, glass and acrylics in a whole new way. Our aim is to connect people to place through creative and innovative solutions helping to create engaging working environments. 4d creations were commissioned to design, produce and install a bespoke interior branding scheme for this incredible 5 story office space on the Quartermile in Edinburgh in collaboration with Michael Laird Architects…. We look to manufacture anything you can come up with whether that be a shelving unit or a custom 6 foot illuminated guitar. Think of us as an extension of your design team, we take how out of your design process and bring ideas to life. One of the materials we can offer is a lightweight concrete that can be cut, formed and inlayed with different materials including metals. This can be used for wall panelling, furniture cladding, as part of a display piece, anywhere where a conventional cladding would work. Using various metals and combing them with different chemicals we are able to produce a wide range of colours, patterns and textures known as patinas. 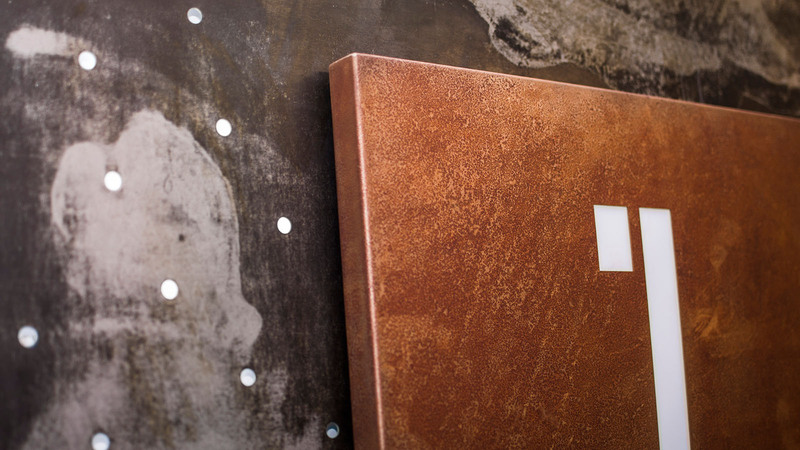 Using these techniques we can create finishes that are rusty and textured to smooth and clean. These materials then have a host of applications from frames and shelving to bespoke art pieces. Part of our collections are our faux panels that can’t replicate resin panels and etched glass. These cost effective alternatives are almost indistinguishable from the real thing from grass resin to reeded glass. We can fit film on an existing panel, supply you with panels already made up and even provide a entire frame system to house them. Our technicians spend time testing and developing our ideas using the latest digital print methods and application techniques . Are you keen to see what we can do? We would be happy to come and show you a selection of samples of our latest work.